Venue: Canadian Music Centre. Chalmers House, 20 St. Joseph Street. The Canadian Music Centre, an organization nearly 50 years old, pushes the envelope of new technologies to connect Canadian composers with the international music community. Since 1949, the CMC has been an integral instrument in directly confronting the challenges to Canadian contemporary music. The CMC acts as a national archive for its 742 Associate Composers, a music publisher, library, educator and much more. 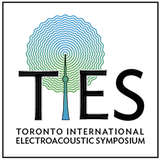 The Canadian Music Centre is a proud sponsor of the Toronto Electroacoustic Symposium. Please join us for a wine and cheese reception, and overview of the many services this diverse arts organization provides. Venue: Rm. 330, Edward Johnson Building, Faculty of Music, University of Toronto. 80 Queen’s Park Crescent, Toronto. Directions: Exit the Museum subway station on the west-side of Queen’s Park Crescent. The Faculty of Music is behind the planetarium, south of the Royal Ontario Museum (towards the park). Catered courtesy of the Faculty of Music, University of Toronto. Venue: Outdoors on Toronto Island. Admission free. Four improvisers (using flute, percussion, and voice) will play a series of solos, duos, and trios on Toronto Island. Each performance is a sensitive articulation of the micro-ecology of that specific moment in time/space. Building on the sensitivity to environment and sound fostered by such composer/philosophers as Pauline Oliveros and R. Murray Schafer, our musical interventions seek to cause a tiny disturbance — a startled recognition — an acute sense of aliveness. Venue: Church of St. Andrew-by-the-Lake, Toronto Islands. Admission $10. Sound Travels renders a portrait of celebrated Quebec acousmatic artist Robert Normandeau through a concert hosted by David Ogborn featuring Normandeau’s works Rumeurs (Place de Ransbeck), Mémoires Vives, Spleen, StrinGDberg, and Hamlet-Machine with actors. Venue: Church of St. Andrew-by-the-Lake, Toronto Islands. See 8 August for information. Saturday evening’s concert will include performances by flutist Ellen Waterman in James Harley’s wild fruits 2, works by David Ogborn and Herve Berolini as well as the best of the soundportraits by Jørgen Teller alongside works by Sound Travels emerging artists. Ariadne Calling (for choir and electroacoustics) is based on vocal improvisations made while walking the land at the Avebury complex in southwestern England. As the sounds unfold while walking the labyrinth, the memories of the land are awakened, the earth is regenerated, the Cretan Lady of the Labrys is invoked.